A bit of explanation for those not familiar with manga and anime : The Lovely Angels, Kei and Yury, are a duo of galactic troubleshooters who, like Bond, confronts various threats to galactic peace. However, in the course of their missions, they sometimes (well, often, in fact) causes more damages than the threat they were sent to stop (including the destruction of inhabited planets), which led to them receiving the not so flattering nickname of "The Dirty Pair" (which the two girls hate, even if it's not exactly undeserved). Well, in the movies, there were cases where Bond could be their inspiration. 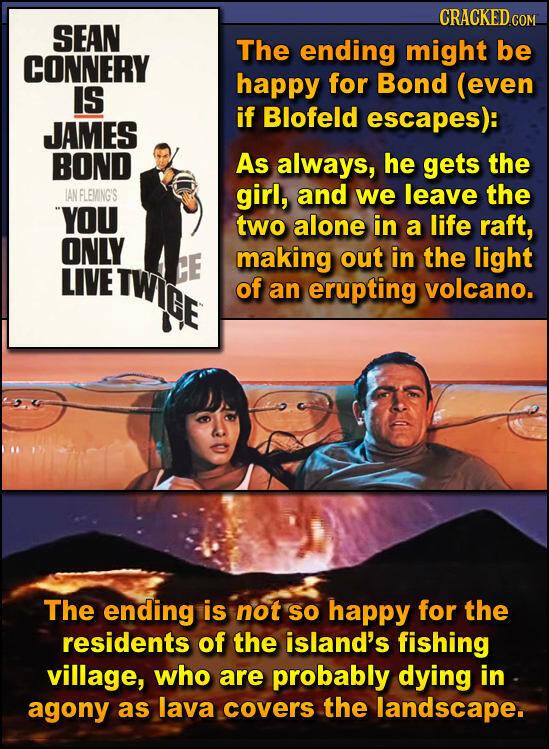 Take Dr. No, for example : Bond confronts the titular villain in his own control room, and sends him to his doom by plunging him into his own nuclear reactor, thus causing a meltdown and the explosion of the base on Crab Key. He then goes on a cruise with the lovely Honey. Everything is fine, right ? Except that, if there was something that Chernobyl taught us, it's that a nuclear meltdown has dramatic and far-reaching consequences, and that (contrary to what the French government thought at the time) borders are no protection against radioactive particles. Which means that a good portion of the Caribbeans are now contaminated, and that the rate of cancers is going to grow exponentially. All that to make sure a rocket launch test goes off without a hitch. And of course, there's the infamous "let's launch a car into a shop from a parking roof over a street in broad daylight" in TND (it's a miracle no one was hurt or killed by that stunt). But are there any others ? 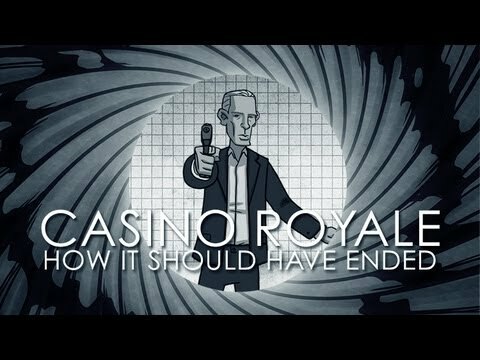 Remember, we're looking for moments when Bond did go overboard and caused a lot of destruction himself, not moments where the villains did it (they're villains, it's expected of them). Perhaps the tank chase scene in GoldenEye? I recall Bond running over and blowing up multiple police vehicles, not to mention wrecking a ton of buildings in St. Petersburg. He wreaked havoc on the Russians in TLD, but that was on purpose so I guess it doesn t count. Imagine if he did the same to the Americans 20 years later. Same thing, opposite reaction. Well, there was that time in Las Vegas... Completely uncalled for, that one. A phone call to Felix would have cleared up any misunderstanding. And lest we forget, he got M killed. Good job. Does this fit in to the category? Because when you think about it, it's clever. Chasing MayDay through the streets of Paris was surely a time when Bond put everyone but the assassin in danger. And he ruined the wedding cake as well! Moore started and ended his Bond carreer with ruining wedding cakes. OP (pts) - how about Bond leading a missile back to an airbase, where not far away a horse exercise was taking place with innocent civilians around. TWINE (pts) - when he runs the Q boat through a densely populated restaurant.. he is lucky that he didn't run over any patrons, who were quietly trying to enjoy their afternoon lunch. 16 years later I am still mad at Bond trashing that plate of delicious looking cookies. And there might have been some repercussion from that volcano explosion in YOLT (both the novel and the movie). This is one of those I dont want to think to hard about as I think just about everything Bond does creates collateral damage greater than the intended goal. The PTS of GE ends with a chemical weapons factory being blown up. Isn't that going to create some environmental problems down the line ? On an positive note, Bond doesn´t consume industrial sugar, which is one of the worst drugs of our society and might in the future be restricted like opium. And to be fair, it´s a well-known fact that radioactivity, much like smoking, only became hazardous in recent decades. In the 60s it simply wasn´t, as you can see from educational films, that it was absolutely enough to hide underneath a table in case of a nuclear attack in order to be safe. Sugar, alcohol and heroin are the worst.